Once fall arrives and we start having all the yummy fall flavors, I wish that I would treat us to them more often year round. This year, I made my own pumpkin puree, maybe that will spread the flavor through the year more? It really was so simple to make the puree, I will be doing that again! Of course, after doing all that work making the puree, I wanted to try it, but on what? There were so many other desserts being shared for Thanksgiving, and we can only eat so much! After bringing home some office leftovers of a pumpkin roll, and Truckin' Man going crazy over that, I knew what direction I was going to head for a recipe. 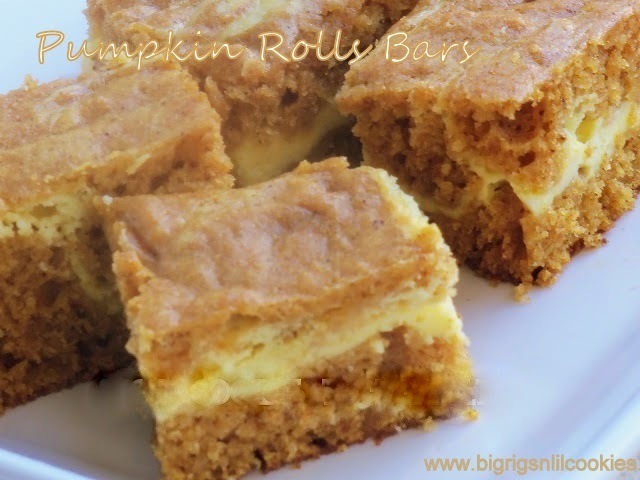 Pumpkin Roll Bars, I had just read about them over at The Recipe Critic. Even though a pumpkin roll is easy (or so I am told), these were so simple. And they were sooo good! Pumpkiny goodness, with a cream cheese layer baked in, what more could you ask for? Of course, Truckin' Man loved them. He had a lot of driving to do last week, so I packed up a bunch for him to take with him. Preheat oven to 350 degrees. Spray a 9 x 13 inch baking pan with non-stick cooking spray. In a bowl, with electric mixer on medium speed, beat butter and 1 1/2 cups sugar until smooth. Beat in 2 eggs, pumpkin, 1 teaspoon of vanilla and water until well blended. In a separate bowl, mix flour, cinnamon, cloves, ginger, nutmeg, baking soda, baking powder, and salt; add the dry ingredients to the pumpkin mixture and combine until well blended. Spread 2/3 of the batter evenly into the prepared pan. 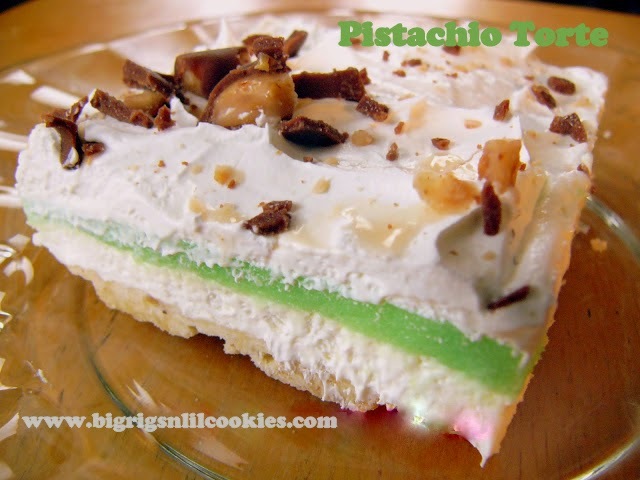 In another bowl, beat cream cheese, 1 egg, 1/4 cup sugar, and ½ teaspoon of vanilla until smooth. Spread cream cheese mixture evenly over the pumpkin batter. Dollop the remaining pumpkin batter over the cream cheese batter and spread out as evenly as possible. With a knife, swirl together the cream cheese and top layer of pumpkin batter. Bake for 30-35 minutes, or until the center of the pumpkin batter springs back when touched. Cool completely in pan, then cut into bars. These do sound good. Might have to try them! These look amazing! I am off to pin them for later! These look so good! Thanks for sharing on Foodie Friends Friday! I think this season my favorite dessert is going to be pumpkin bars. This recipe sounds delicious and looks very easy, my favorite. Thanks for sharing with Foodie Friends Friday this week. I'm sharing this on my FB page. What a great idea! The rolls are always a little intimidating to me, but these look lovely! What a brilliant idea! I REALLY REALLY love this recipe. Thanks a million for sharing with us at Weekend Potluck. Pinning!